EXPRESSO – Page 2 – Go There. Try That. These past few rainy days have provided the perfect excuse to grab an extra cup of coffee. Really, any type of weather is coffee weather. When it’s hot, grab a cold brew. When it’s cold, grab a cappuccino. But when you drink, drink local! Even when we travel, one of the first things we research is local coffee roasters. We are always in search of an incredible cup of coffee, and an incredible cup of coffee comes from freshly roasted beans.I’ve said this many times, but I am a huge believer in supporting local businesses and Cincinnati has some of the best! Today I’m talking about local coffee roasters in the Cincinnati area. I’m not a professional coffee roaster, but I’ve watched professionals roast coffee and I’ve taken coffee classes (all at local roasters). Here’s my takeaway: roasting coffee is equal parts art, science, and passion. Nothing compares to a fresh cup of coffee and by buying locally roasted coffee, you know it’s fresh. Each bag is marked with a roasting date! To ensure the best cup of coffee, you want to use coffee within two weeks of that roasting date. This is what you find from local roasters and not from coffee sitting on a shelf in a warehouse. Local coffee roasters are also careful and conscientious about sourcing their beans. Many of our Cincinnati Roasters have relationships with farmers; they buy direct ensuring that workers are paid fair prices in safe working conditions. We have so many great roasters in Cincinnati and while I’d like to eventually cover them all, I’m going to start by highlighting what I love at a few of my favorite roasters. 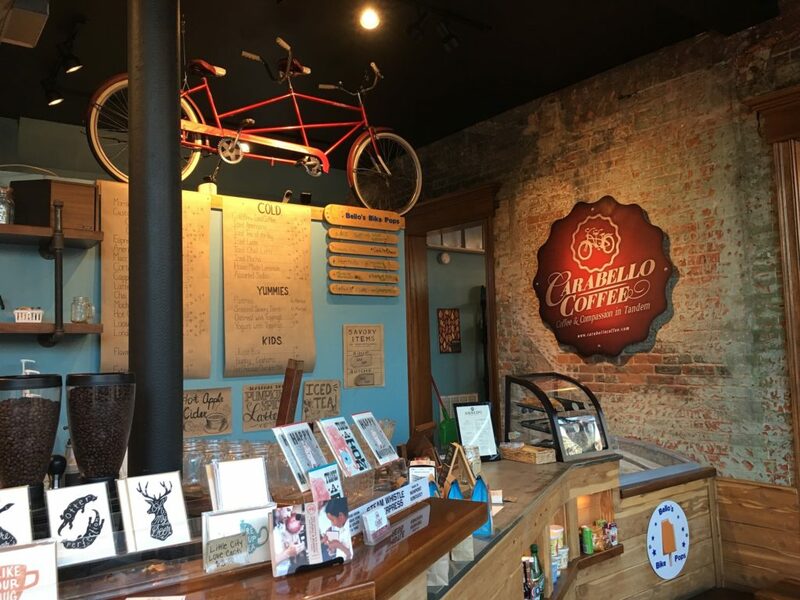 Located in Newport, KY, Carabello Coffee is a philanthropic roaster. Carabello donates portions of their proceeds to several different charities. The older I get, the more important it is for me to consider where my money is going and what it is supporting. I know when I get coffee from Carabello, it’s fair trade and often farm direct. The owners, Justin and Emily Carabello, have built relationships with farmers in Nicaragua. This is responsible sourcing at its best. I’m also a huge fan of Carabello’s Analog Bar. Basically, baristas serve up coffee cocktails, provide tastings, and demonstrate different brew methods in a small group setting. Carabello also has a relationship with Braxton Brewery and if you have not yet tried Braxton’s Starter Coffee, check it out! Oh, and the cold brew on nitro served up at Braxton (roasted by Carabello) is the smoothest, creamiest, most delicious cold brew that ever was! Carabello Coffee shop is a bright, clean, inviting environment to spend time with friends! If you stop in, be sure to check out Bello’s Bike Pops as well! The Vietnamese Latte is my go-to gourmet pop. I’m positive you will love this local roaster. Coffee Emporium, one of the oldest coffee houses in the Cincy area, is the first local roaster I fell in love with after moving to Cincinnati. Coffee Emporium brews up a consistently great cup of coffee every single time. This place pays attention to detail and their level of experience is remarkable. Roasted in downtown Cincinnati, Coffee Emporium roasts high quality beans in small batches; I dare you to smell those beans when you open a bag of coffee from Coffee Emporium. Heavenly! You can sit down and enjoy coffee from Coffee Emporium in one of their two locations: Hyde Park and Downtown. I go to Hyde Park because it’s close to my house, the patio(s) are super sweet and cozy, and the baked treats are always fresh. Downtown is nice because it serves up a strong food menu, has a more industrial feel, and is always alive with customers. In addition to roasting, serving, and selling coffee, Coffee Emporium also has speciality teas. And, any fans of New Riff Distillery will like the Bourbon Barrel Aged Coffee made in collaboration with Coffee Emporium and New Riff Distillery. Urbana coffee began their roasting journey at Findlay Market. In fact, Urbana still does all their roasting at Findlay. The owner, inspired by growing up in Venezuela, spending some time in Italy, and seeing the Vespa Apes (three-wheeled light commercial vehicle) in action, began with the Urbana Mobile Espresso Bar! You can see this mobile coffee bar at Findlay and other local events and venues. In addition to Findlay Market, Urbana has two other locations: Pendleton and East Walnut Hills. Both coffee shops are welcoming, bright, and modern. 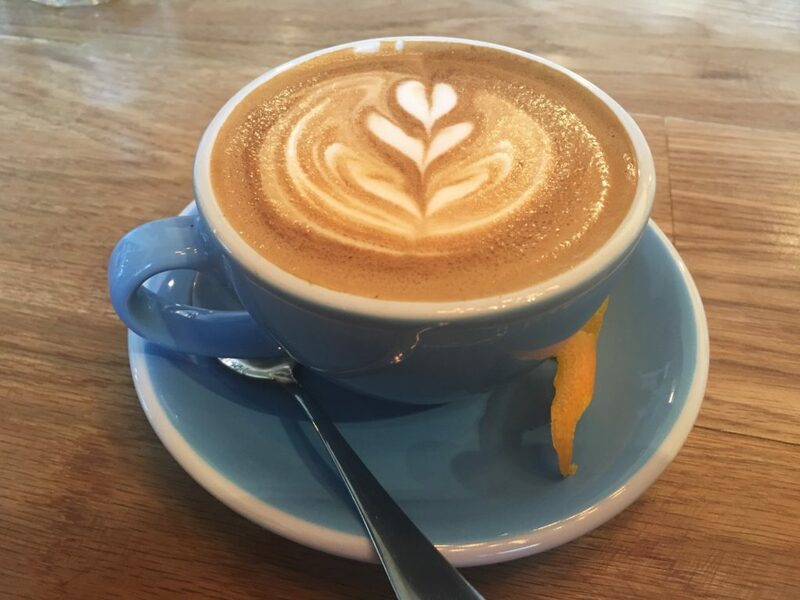 When you stop by Urbana, try the Flat White (espresso, steamed milk, microfoam); it’s super creamy and delicious. And, like the other coffee shops mentioned in this post, Urbana serves up some melt-in-your-mouth treats like Almond Croissants, Banana Bread, and Scones (also made locally)! I think what I appreciate most about Luckman is that it’s a great cup of coffee served up in a no frills environment. The baristas are friendly and knowledgeable, and they can make pretty much any coffee drink even if it’s not on their menu. 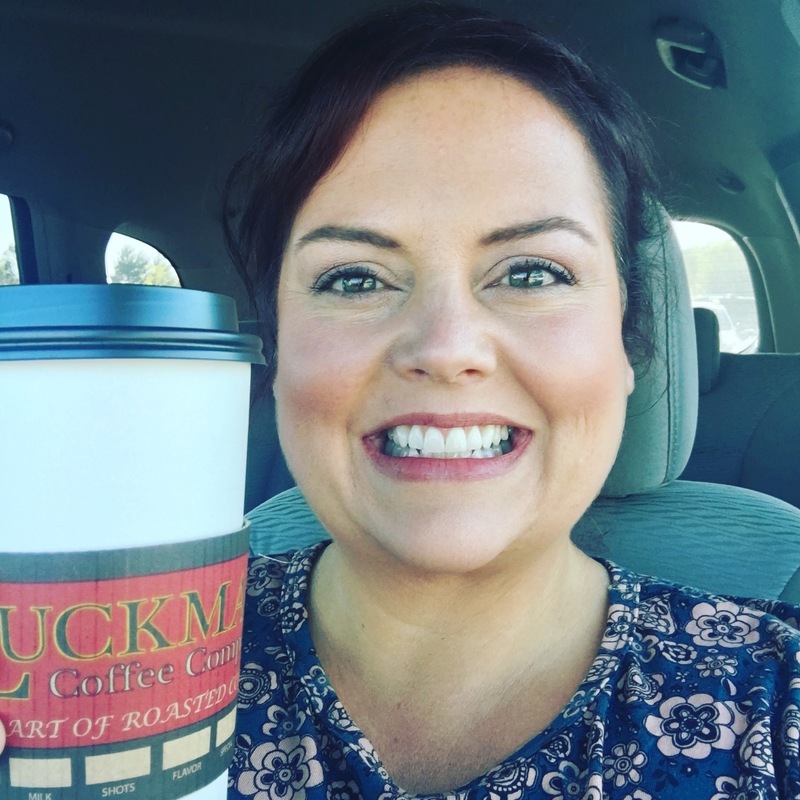 Luckman’s roasts their coffee in Mount Washington and plays well to the locals with their Little Miami Blend (an homage to the Little Miami River) and their Peg Leg Jim Blend (a dark roast with a sense of humor). Best part? The owners of Luckman care about their customers and take time to get to know them! You can enjoy a cup of Luckman’s at two locations: Mount Washington and Anderson Township. And, the Anderson Township location has a drive-thru! Score! Other notable local roasters include: Lookout Joe, La Terza, Deeper Roots, Seven Hills. While I haven’t covered all of these in this post, I’ve had a great cup of coffee from each! Many of our local coffee shops in Cincinnati serve up coffee from these roasters as well! When you shop local, drink local, and support local, you’re making your money matter. I own a shirt that says: Stressed. Blessed. Coffee Obsessed. If I had to be obsessed with something, I’m certainly glad it’s an incredible cup of coffee! Find me at a local coffee shop and I’m a happy woman. Cheers to my fellow coffee addicts; we know what’s good in life. GO THERE (Carabello, Coffee Emporium, Urbana, Luckman)! TRY THAT (Supporting local Cincinnati Roasters)!